Our fifth Premier League win on the bounce is something which many of us wouldn't have believed would be possible this far into the season given the miserable start to the campaign we have had to endure. But Saturday proved that we've turned the corner once and for all. Coming off the back of an international break and facing a newly promoted side, we could have been on the end of the wrong result. Certainly that might have been possible last season, where these types of games were seen as winnable, even without the team putting in a shift to ensure we took the three points. That mentality is certainly gone this season. I think it helps that Arsene Wenger has invested in players like Mikel Arteta, a Spaniard who cannot force his way into his national side because of the amount of talented midfielders Spain coach Vicente del Bosque has at his disposal. Arteta should by rights be in the Spain squad but because he's not picked, Arsenal benefit. Playing for us is his primary goal. If he's not in the Arsenal team he's not playing football at all. Arteta has one thing to focus on... Arsenal. And whilst we have a huge number of international players within the squad, it doesn't hurt that Arsene Wenger has brought in mature individuals who will ensure we don't slip up in games like this. I think it's also important that our captain is 100 per cent committed to the cause. You can see what a huge difference Robin van Persie has had since taking over the role from Cesc Fabregas. Whilst Fabregas was a fantastic player, he didn't have the same amount of passion which van Persie exudes every time he puts on the captain's armband. The Dutchman might have been off playing for the Netherlands last weekend but knows where he's most needed. Like with Arteta, van Persie's primary goal is to play for Arsenal. And I think the manager has finally got the message across that if you're playing well for Arsenal you'll be given your chance at international level. One player who that's applied to more than most is Theo Walcott -who is still to find consistency week in, week out - is a far better player now than he was at the start of last season, fresh from his World Cup disappointment. "I've been working hard in training and it's definitely paying off this season. "I think you always want to learn no matter what age you are and when you have a disappointment like the World Cup then obviously you want to come back and show people what you want to do. "Hopefully I've done that and I'm enjoying my football, looking after myself, staying fit and when you're playing it makes it so much easier. "The more games you play the more consistent you can get. The other guys get used to playing with you as well. "The manager has given me a lot of trust, not just going forward but defensively as well. Everything seems to be working now." 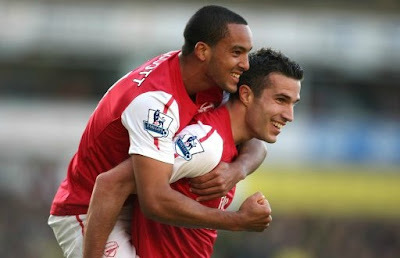 Like van Persie, Walcott's contract expires in June 2013. For him a decision to stay at Arsenal is a no brainer. He's developed so much under Wenger, to move now wouldn't be what's best for his career. He may well earn considerably more money elsewhere, but is he going to develop as a player whilst sitting on the bench at another Champions League club. Chelsea made an approach during the summer, but Arsenal knocked them back. It is clear that Walcott is part of Wenger's plans and discussions over a new contract should start before the year is out. "I’m happy playing football at the moment. My agent will be dealing with my contract. I just want to play football. They can discuss it and see what happens." With Arsene Wenger doubting his own future beyond the end off the season - something which the Arsenal board will not entertain talk of - it is important we tie down Walcott and at the end of the season van Persie who you would hope would follow in his friend Thomas Vermaelen's footsteps and sign a new deal. The manager has come out in the defence of Per Mertesacker following his mistake which led to the Norwich goal. Prior to the game I was convinced the boss wouldn't split up the Koscielny/Vermaelen partnership and stick with Johan Djourou on the right. However as we know, the German was given the nod. "He had not completely recovered [from the internationals]. It is a different game in England, a very demanding game for the defender. "In every second of the game you are really tested with full commitment, and it takes some time to adapt." Personally I hope Wenger reverts to playing Djourou on the right on Wednesday night. I think Mertesacker needs to be taken out of the firing line for his own sake. I'm glad that the manager admonished the German after Saturday's game. No one should feel their place in the team is safe and we may see Wenger axe him for our next game. I don't think Mertesacker is a bad player. I believe that after starting eight of the nine Premier League games since his arrival, he could probably do with some time to analyses his performances from the sidelines. The next six weeks are going to be very busy and there will be times when the manager will have to rotate his defence. Giving the German some time off now wouldn't be a bad thing in my opinion. For some extra reading, take a look at Martin Keown's analysis of van Persie's run of form in the Daily Mail. For now though, the players need to concentrate on Wednesday night's Champions League match with Borussia Dortmund, who beat the Bundesliga leaders Bayern Munich 1-0 at the weekend. A win for Arsene Wenger's side would see them qualify for the knockout stages. It'll be our first game for nearly three weeks at the Grove, so the atmosphere is sure to be a good one. Elsewhere, there is more disquiet from the Arsenal goalkeeping department. This time from the Italian Vito Mannone. He wants Arsene Wenger to let him leave the club on loan with a view to the deal becoming permanent, according to The Sun. And there is transfer tittle-tattle in the Daily Mirror, who last week suggested we were one of the favourites to sign Paul Pogba when his contract runs out at Manchester United. Now they report Roberto Mancini's scouting team are watching the situation. The 18-year-old French midfielder is regarded to be a huge talent. That's it for now. There are a couple of posts due to go live later in the day. We've got an Away Days piece from Carrow Road, plus an Inside the Formation post on Thomas Vermaelen's contributions to Saturday's win so look out for them later.